It is a nightmare if by mistake or some other reason you have to lose your important emails, messages of communication with your friends and family, organized calendars, notes, reminders, photos, and videos stored on your iOS device. What’s worse, if the loss also contains valuable business information or confidential data. Ideally, you would always prefer to have a backup of the important contents of your iPhone. Well, iOS users can easily do that through iCloud, with a condition that you are connected to it and have a Mac! However, how many of us get time to back up the content on iCloud. Probably! Very few. So, is there an easy solution to retrieve deleted Text Messages and other lost data on iPhone? Yes, there is. 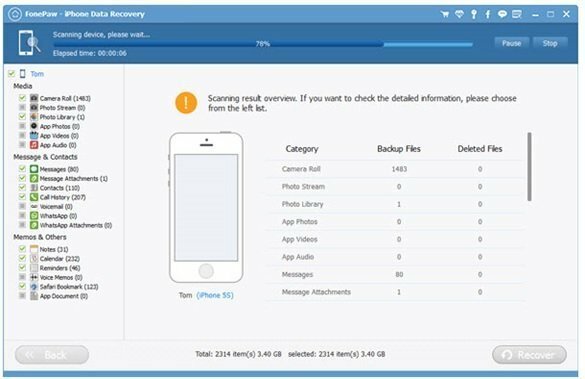 iPhone Data Recovery can be easily done with iPhone Data Recovery software from FonePaw. It is a great tool to recover all your lost information. Here is more about the tool and how to use. FonePaw iPhone Data Recovery tool is only for iOS devices. 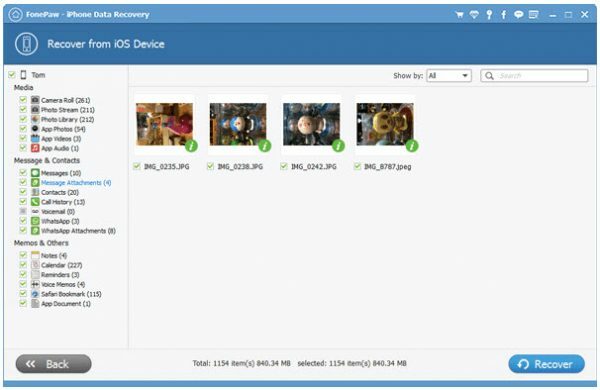 The software can recover data that was deleted or lost from iPhone, iPod or iPad. This app allows you to connect iPhone, iPad or iPod touch even if they are not working. It thereafter scans the device and produces all the data that was deleted or stored. FonePaw iPhone Data Recovery software is easy to use and user-friendly. Just within few clicks, it enables you to retrieve the lost data. The makers of the software have followed a unique way of keeping the tool up-to-date. They have been improving its features through the feedback received from the users as well as trying to make it more user-friendly. It even displays in-app audio, photos, and videos for selected apps. However, some of these files are background technical files which are used by apps to run. 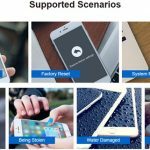 FonePaw iPhone Data Recovery tool supports all iOS devices like the initially launched original iPad to the updated one.It supports iPhone 3GS to iPhone X and 8 Plus, and iPod touch 4th-generation and newer as well. 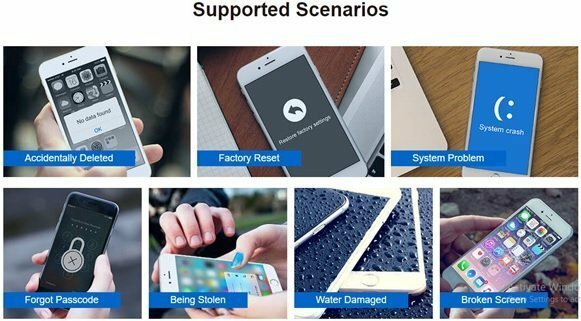 FonePaw iPhone Data Recovery is easy to understand as it is based on the wizard-like user interface. It gives clear instructions while guiding through the process. It scans the iOS device whose data needs to be recovered. The software works at a high speed. For instance, to scan the entire 64GB data of iPhone, it took only a few minutes to deal with many items running in the background. Another useful feature of the tool is that it permits you to view the content that it has retrieved even when the entire scanning is not completed. So, now you won’t have to wait till the entire scan gets completed to view your content. The retrieved data is well-presented in easy to navigate form. Data is arranged in the form of thumbnails for images and videos while message thread previews and tables are well arranged with contact and call history information. Connect iOS device: Firstly, connect the iOS device whose data needs to be recovered to your PC or Mac with a cable by following the instructions. Scanning: Automatically, the software will scan the entire content of your device. It will take few minutes for the scan to complete. The result will be displayed in the categories of the Backup files and the Deleted files. Preview and Save data: Take a view of the recovered data and click on the items that you need to save on your computer. Then press the “Recover” tab and all the selected items will be saved on your computer. While we could not find many flaws in the software, there are some shortcomings worth mentioning. You cannot run iTunes on your Mac when FonePaw is running so as to avoid creating a new backup and overwriting an older one. There is no such option as to filter by deleted items only. This implies scrolling through the entire list of information (imagine 64GB) to search the data you are looking for. Though there is search field, but it is not useful for all the data. To justify, the image is stored as IMG_xxx. It is difficult to search a particular image that you are looking for this way. 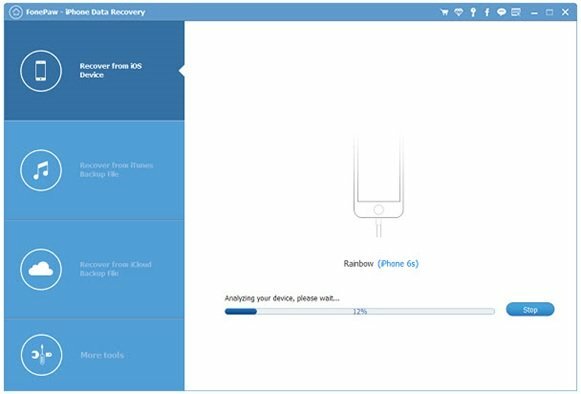 When data is recovered, now restoring it back to the iOS device is a cumbersome task, as at present, they are stored in the computer. Photos, videos are stored in JPEG or PNG format while contacts are saved as cross-platform CSV files and notes are saved as TXT files. These formats are easy to understand and hence easy to save and restore back to the iOS device. However, message threads and call history are recovered in HTML format. It is difficult to put them back on the iOS device. The software can be downloaded for free. It allows a free trial version for 30 days. However, this trial version allows only thumbnail image preview, a few Contact or Call History entries visible. 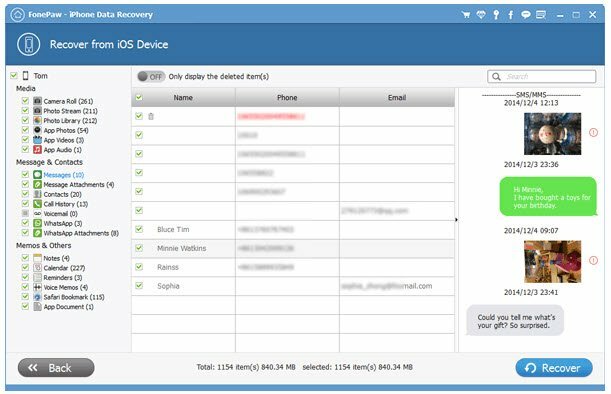 Once purchased, the FonePaw iPhone Data Recovery software all the data can be recovered. However, the cost to purchase this license is $69.95!! The cost suggests that the recovered data should be as valuable as the software to purchase for. The FonePaw iPhone Data Recovery software has good features, capabilities, and usability. Check out the software online for yourself. Download it and explore it. If you feel the price value for your crucial information you can purchase the license in-app or at the FonePaw store.